THE EUROPEAN TOUR has stepped up its bid to combat slow play with the announcement of a new event for 2018 – the Shot Clock Masters. This year’s innovative GolfSixes event, which featured entrance music for players, celebrity hosts and increased fan interaction, experimented with the use of a shot clock on one hole. However, the tour’s latest addition to the schedule – taking place at the Diamond Country Club in Austria next June – will see every shot subjected to time limits in a first for professional golf. The first competitor playing any given shot in each group will be afforded 50 seconds, with subsequent players getting 40 seconds. Each player will also have the right to call two ‘time-outs’ in each round, giving them double the usual allotted time. Any player picking up a ‘bad time’ will incur a one-shot penalty. Email “European Tour introduces the Shot Clock Masters to combat slow play”. 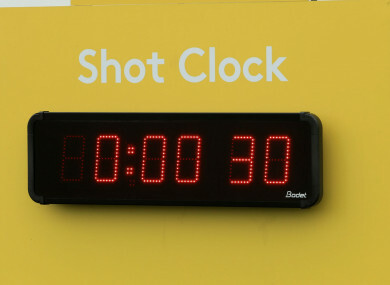 Feedback on “European Tour introduces the Shot Clock Masters to combat slow play”.